Emma Cline’s debut novel The Girls examines female friendship in a 1960s cult commune similar to the Manson compound. 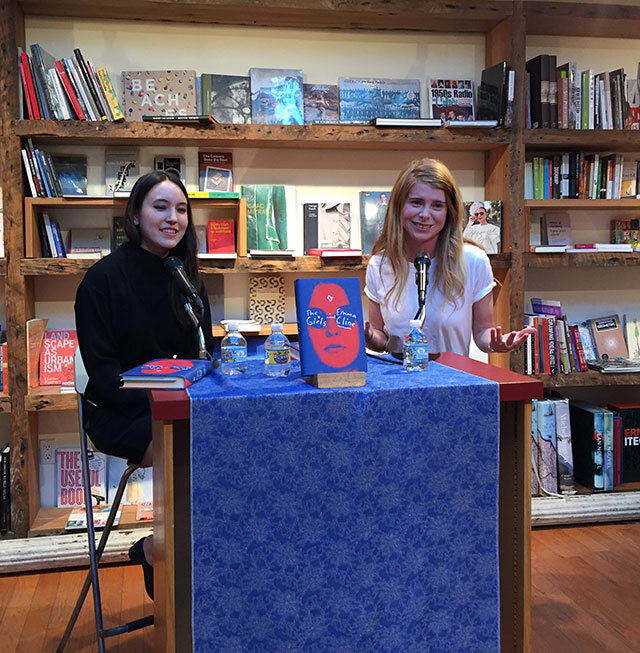 She was at BookCourt to discuss the novel with Alexandra Kleeman, author of You Too Can Have a Body Like Mine. The first thing Kleeman points to is the observations of girls in the novel from the female perspective. It is not a common point of view. Cline says she wanted to think about the female gaze especially as a comparison to the male. How other women see other women is important, she explains. The novel focuses on two women, Evie and Suzanne, while the cult leader is relegated to the background, another intentional decision Cline made in order to center on the female relationships. Books about cults often focus on the male leaders rather than the followers, particularly the female followers. Cline came across her mother’s diary, written when her mother was 13 around 1964. In the diary her mother wrote about the mundane happenings in her life rather than any of the historic moments she lived through. Instead of writing about men walking on the moon, she focused on small details about herself. Cline had hoped the diary would have all the answers she needed for crafting the story, but in the end it was just too banal. There are plenty of contemporary parallels to the Manson cult and the young women who join modern groups. Cline cites the allure of ISIS for young British women. Teenagers want to belong, and that fuels their interest in cult-like organizations. “I read a lot of groupie memoirs,” Cline says. She explains that with groupie memoirs, readers are supposed to care about the male musicians, but the girls are the ones putting out the creative energy. They create the legends that people end up caring about. She found herself attracted to exploring the women making those myths. The novel was an evolutionary process. She had been working on a commune novel. Ultimately she liked the girls at the center of it all and decided to focus on their story. Female friendships come with fewer expectations than romantic relationships, but share many of the same attributes of intimacy. Growing up Cline had a lot of nostalgia for the 1960s. She longed for that period in time and writing the novel was a way of exorcising that desire from her. For now she is looking forward to 2017 when the last of the book promotion ends.